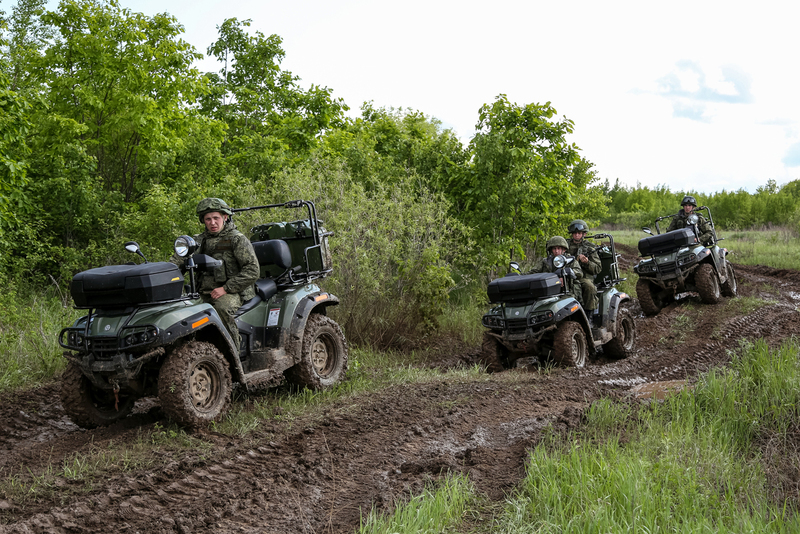 Cadets of the Marshal Rokossovsky Far Eastern Higher Military Command School drive ATVs RM 500-2 during training exercises at the fire range in the Blagoveshchensk District in the Amur Region, Russia. In 2018, Russia will deploy a coastal defense division equipped with quad bikes on the Chukotka peninsula. According to military experts, motorized infantry will protect the coast against potential landings by enemy saboteurs. Russia is to deploy a coastal defense division on the Chukotka peninsula in the far northeast of the country in 2018. The new division will be formed of infantry battalions, which will patrol the Bering Strait coastline on four- and six-wheeled quad bikes. According to a RBTH source in the military-industrial complex, a policy decision to establish the new battalions has already been made. The issue of the required number of infantry units and vehicles for the defense of the Chukotka peninsula is currently being discussed. Military officials have preferred all-terrain wheeled vehicles to snowmobiles for several reasons. The coastal area of the Chukotka peninsula is rocky, often marshy and covered with only a thin layer of snow, which necessitates the use of wheeled vehicles. In case of alarm, rapid-response teams are needed, which can go over rough terrain to the area of operations as soon as possible, and will hold the enemy's advance until the main forces arrive. As the RBTH source said, the Defense Ministry is considering the purchase of army quad bikes produced by the company Russkaya Mekhanika. The vehicle is designed based on the RM500-2 production model and is equipped with a four-stroke single-cylinder engine with 38 horsepower. This all-wheel drive unit is able to overcome land and water obstacles and operate in low temperatures down to minus 30 degrees Celsius (-22 Fahrenheit). According to designers, the frame of the army quad bike is protected by powder coating, and all the connectors and wires are covered with damp-proof fiber. The body of the military quad bike has a set of armor designed for protection against attacks with small arms. The vehicle's anchorage system allows the mounting of a grenade launcher, and also allows soldiers to fire sniper and automatic rifles. At present, the designers are seeking to upgrade the quad bikes so that they can be mounted with 7.62-mm machine guns. Russia's motorized rifle divisions use BMP-2 and BMP-3 infantry fighting vehicles as well as BTR-80 and BTR-82 armored personnel carriers. Meanwhile, the Arctic infantry uses MTLB towing vehicles and DT-30 Vityaz two-unit tracked carriers. The army quad bike and other samples of Russia's newest weapons will be seen during the Army 2016 military-technical forum in the Moscow Region from Sept. 6 to 11.